Unlike other corporate styled wedding videographers in Cincinnati, OH, Elegant Films takes a completely personalized approach to weddings. They treat every celebration as a unique event and will never use the same style unless it suits the couple and type of event. Edmund Luft, the principle videographer, is a 5-time EMMY Award winning videographer, producer and editor. This level of expertise is priceless when you want your special day covered perfectly. The packages are comprehensive, completely customizable and surprisingly affordable, so you will find something for you. At McRoberts Video Productions they cover projects ranging from editing to promotional shoots. While they are talented in this kind of work they have become famous for being top class Cincinnati wedding videographers. This company only hires the most talented videographers and editors as they only want to provide their clients with the very best in the industry. They will work closely with you to get to know your style and tastes, then they will exceed all of your expectations. 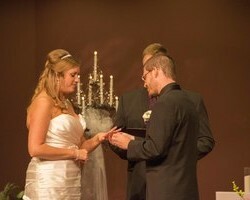 The reviews of past clients show this happens with each wedding they capture. The videographers at Cinevita Films approach their work knowing they are capturing once in a lifetime moments. This means they take their work very seriously. Although they do everything to get every second of the day they know how to relax the guests and make them feel comfortable in front of the lens. As some of the friendliest professionals in Ohio you will get a flawless reflection of the day in an expertly edited film and all for competitively low prices. What could be better than an award-winning wedding videographer whose only goal is to make their clients happy? Clapboard Video has gained an incredible range of skills by filming all kinds of events. In terms of wedding videography this has made their finished films even more unique. For highly affordable prices, these professionals are able to produce a fantastic film that captures every aspect of your day. Their list of packages is easy to select from or you can contact them for tailored rates. From the reviews left by previous couples you will quickly see just how professional Dugan Studios is. The team pride themselves on capturing every moment but also completely blending into the background. The videographers start filming an hour before the bride even gets her gown on and they don’t stop until the last guest has left. This kind of approach means you get a full perfectly edited memory to watch back again and again. View their past videos to see just how great their work truly is.